Organize legal documents quickly and professionally with convenient desktop kits. Plastic, self-adhesive tabs grip both sides of paper for extra strength and durability. Includes indexed dividers and recipe-size box. 1000 tabs per kit. Alphabetical kit contains 1" tabs of Exhibit A-Z and strips of "Exhibit" and "Index" tabs. 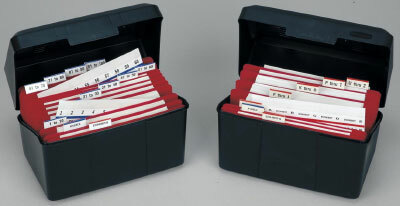 For more information on this product, call 800-845-9010 or email request@ancom-filing.com.